Dreams are supposed to be made from the contents of your mind. So where did this very detailed dream come from? Location - a house, but not my house. Scene - a large, cluttered living room adjoining a large, empty dining room, and in line of sight of the kitchen with 50's era appliances. I am playing with a turtle on the floor, letting it wander across the wooden floor and area rugs. It is a small box type turtle about 6" in diameter. The shell is more of a rounded rectangle with ridged edges. I put the turtle on the arm of a couch. The couch is covered in a solid color brown, tightly woven fabric. I place the turtle near the back of the arm. It reaches the end of the arm so I put it on the seat of the couch. We find the turtle, a sweater, 2 shirts, and 2 slats of light colored wood of differing lengths and widths. "I wondered what happened to that shirt", I exclaim. And I wonder where in the world this dream came from. Recently I got a letter from Bat Conservation International (http://www.batcon.org) concerning a new Lego game, Heroica and its portrayal of bats as monsters. As BCI stated in their e-mail: "It is unfortunate that Lego, a leader in children's toys, chose to perpetuate this outdated myth and reinforce baseless fears of such beneficial animals. For centuries, myths and misinformation have led to declines in bat populations. Without bats, humans would be in serious trouble." BCI requested that people contact Lego in protest. Unfortunately, I didn't save the message I sent. But the gist was that I felt they were perpetuating bad information and encouraging children to be afraid of bats. Here is part of the Lego response: "There is a long tradition for using animals as icons when creating stories that trigger the imagination of children. Children are able to distinguish between fantasy and real life, and we believe that playing this board game will not encourage them to harm living animals." But bats are not fantasy creatures. Bats are living animals with a public relations problem. They don't need to be cast as monsters in a game. I'll tell you why I joined Bat Conservation International in the first place. Because I was irrationally terrified of bats. I lived in a house out in the Iowa countryside where critters tended to get inside. I had a plethora of mice, a couple birds, a squirrel, and even a snake enter the house. Not one of them bothered me as much as it did when a bat got into the house. Lego expects a child to understand the difference between fantasy and reality. At that same age, I was exposed to the Dracula and vampire mythology. I was told that bats will get tangled into your hair. That they will bite you, and drink your blood. None of it true. All of it fantasy. And it didn't matter. As an adult, I was still terrified. 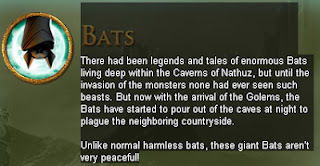 I researched bats and found these misunderstood creatures are beneficial to human society. Some of them are even cute. I assuage the guilt I felt over my fear by donating money every year to BCI. 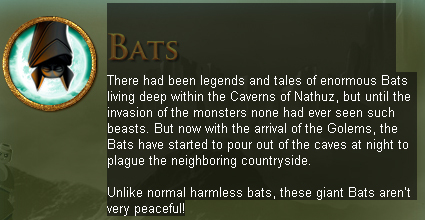 Casting bats as monsters will instill that same fear into another generation of children. Not surprisingly, I have become attached to my smart phone. I don't make that many calls, and I only sent or received 85 texts last month. I use it mostly for games, Facebook, Twitter, and internet browsing. And as an alarm clock. Having the phone flat on the table made it difficult to check the time. But the cell phone stands I saw were either ugly or expensive. I started with a small metal plaque stand. I took a piece of bead looming I had been experimenting with. and put a backing cloth behind it. Then I glued the suede around the edges of the plaque stand. Voila!, My cell phone sits at an angle that makes reading the desk clock app easy. And I can find the phone to turn off the alarm in the morning. 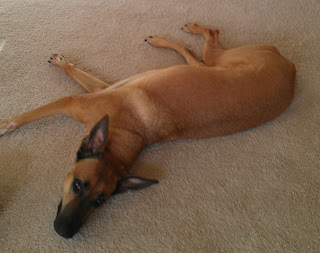 Angel, waiting for me to finish working. She had the knee surgery. Peanut, waiting on the stair landing. She has the heart condition. People generally want to be remembered for the skills they have, the things they do, and who they are. I know I do. But I am not sure that the recognition I got today is a good thing. I took Peanut back to the veterinary cardiologist to have her heart rate checked after a prescription change. We walked into the busy lobby and the receptionist said "I'll let them know you are here." I was both flattered and dismayed. Flattered that she remembered me, or my dog. Dismayed that we visit the vet often enough to be remembered on sight. After finishing there, it was time to go to Walgreens to pick up my prescription refill. Again, I walked up to the counter and the pharmacist selected my prescription without having to ask my name. She did the address check, but only because it is required. Do I visit often enough to be remembered? Do these people have better memories than I do? Do they have tricks that help them remember names and faces? I caught the end of "Wendy Wu, Homecoming Warrior" while I was waiting to leave for an appointment. It's a cute Disney movie and one of my favorites. But like a lot of movies, and some books, it leaves me wondering what happened after? The credits roll and too many questions are left unanswered. Did Wendy's friends shun her for not showing up at the Homecoming dance? How did her mother react when she saw the mess the museum was in? Who is going to pay for the damaged antiques on loan from China? Will Wendy and Shen become a couple? If so, will they be happy together, the homecoming queen and the ancient monk? Like life. But with cooler outfits. Anyone who has ever read this blog knows I love my dogs. But they are dogs. Grown up dogs. Big dogs. 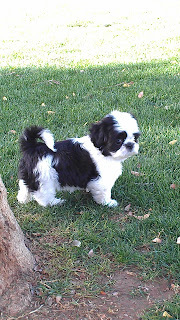 So I am smitten by my sister's puppy, a tiny Shih Tzu, less than 4 months old. Less than 5 pounds, she has a puppy's energy with the advantage of being unable to knock you off your feet in her enthusiasm. She does, however, have razor sharp baby teeth, so there is a trade off.